Who's going to buy it? We're not sure. Just when we were running out of things to throw our money at, along comes another product nobody asked for. Startup Looking Glass made a "personal volumetric display" called Volume that it says will let you see VR (really, 3D content) without a headset, so you can share such content with people around you. The display is also interactive so you can move things around either by swiping on the touch-sensitive screen, waving your hands in front of it or pairing up a gaming controller. The company claims it's the world's first affordable personal volumetric display. What's more, such an outlandish device has an equally far-out price, should you want to buy it: Volume is now available for preorder for $999. To be fair, this is a first-generation device that's intended for early adopters or developers who wish to create content for such a canvas. And based on my brief experience with a preview unit earlier this year, Volume doesn't seem ready for the general public. Although it delivered on its promise of providing holograph-esque 3D images that everyone in front of it could see, the graphics seemed faint, especially in brighter light. Despite its resolution of more than two million 3D pixels, the projected pictures also seemed somewhat blurry. Don't get me wrong -- I thoroughly enjoyed myself playing a game where I had to move my hand in front of the Volume in tandem to the rhythm it played. But I still had a hard time seeing at least this iteration of the display taking off. The company used a technology that it developed, called "lightfolding," that projects millions of points of colored lights into a glass cube that measures 21.2 x 10.6 x 7.6 inches. The screen's dimensions are 10.1 x 7.6 x 5.9 inches and it acts as a canvas for the light show. The projector is housed at the bottom of the unit. With an optional Leap Motion add-on, you can wave your hands in front of the screen to move objects around, or use the included touch sensitive panel. Volume is integrated with Unity3D, so developers can more easily display their projects on the device. The company says it's looking to release a range of plugins to support 2D creation tools as well. An app library will also be available with several free titles including 3D Etch-a-Sketch, Adobe Animate, Volume Paint, Volume Sculpt as well as Volumetric arcade games. It will also offer Holoflix, an iPad app that lets you record and playback volumetric videos. Looking Glass emphasizes Volume's ability to let groups of people "experience 3D content simultaneously without any additional accessories," such as headsets. But glasses-free 3D TVs and projectors have already done that, and deliver superior image quality as well. The HoloFlex, a smartphone cover that's a bit more similar to Volume, also suffers the same issue with resolution, although it uses different technology. These examples lack Volume's capacity for touch interactivity at the moment, though, and also aren't available for consumer purchase just yet. I won't deny that the idea of a personal holographic display is pretty cool and could be a great tool for collaborative work. But the idea that a $999 device is "affordable" is harder to repeat with a straight face. 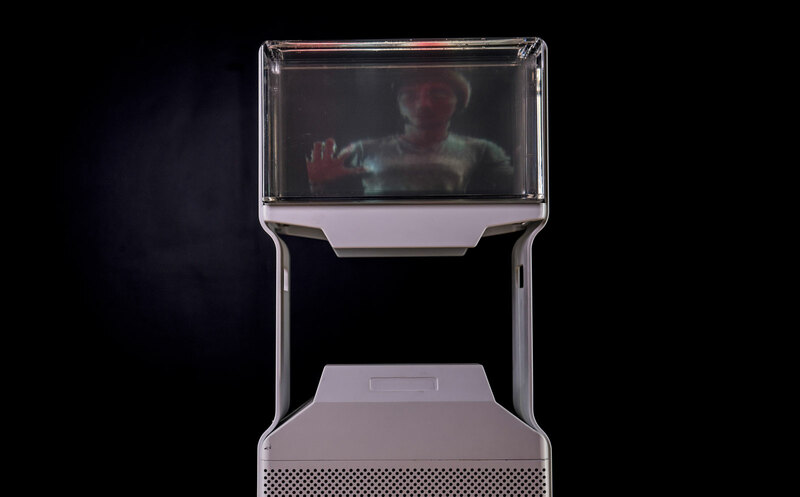 Looking Glass said its lightfolding technology reduces the cost of traditional volumetric displays nearly one-hundred-fold, which is impressive. But until the experience gets better in later-generation models, it's difficult to see the typical consumer shelling out for Volume.